How and when is it appropriate? 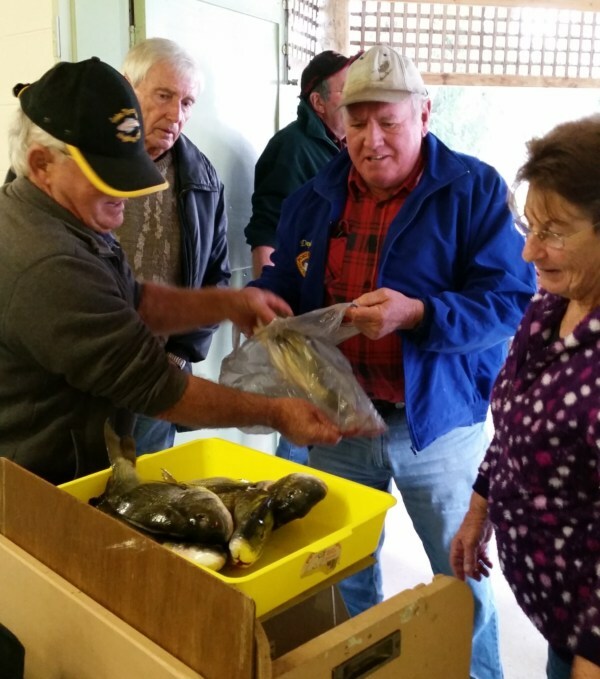 News: Gus was awarded Heaviest Bream for 2015 on the Honor Board at Lake Tyers Beach Angling club. Well done Gus!!! No Fuss showing here, how to support a fish for a photo, see our "Care of Monsters" campaign. Most published Fishing Tips pages are only current for a few days or maybe a week or two. My much loved brother Peter many years ago coined a phrase "The Piscatorial Notes" where the observations, bait and catch etc are recorded in a diary for checking back over in subsequent seasons. He felt he could look ahead, by checking the past cycles, and then, predict what might happen in this season based on previous years. And if you have previously followed Ian Page with interest I suggest you check these digests. So at the risk of chewing up a small amount of space on the server, the complete history will be maintained for your scrutiny. This could start to pay off after middle of year 2010+ and beyond when we begin covering the same seasons over again. Good luck and taut lines!! New to the game? Check this quick info on baits, knots and rigs. So grab the rods and the family and make a day of it. Thanks to the Tasmanian Department of Primary Industries, Parks, Water and Environment for links to species. Take advantage of these line bins and dispose of your unwanted line responsibly, or if you find someone else's line show them what they should have done and put in the mini-bin on the post. Disclaimer: These notes are provided in good humour to make your fishing more enjoyable. We don't have anything to sell apart from sharing a good time with you at Lake Tyers. We report the good and the bad, the big catches and the "non" catches. However all advice is offered on a "user accepts all risks" and should never be taken as firm advice, but just as a general guide. Please keep this mind when making decisions that involve your own personal safety or others' safety and your possessions. Check Water Wheel Beach Cabins for your mates' next trip. Reports have been indicating Easter should bring joy to many fishers. Mixed bags of good Flathead and bream have been taken, though on bait mainly. 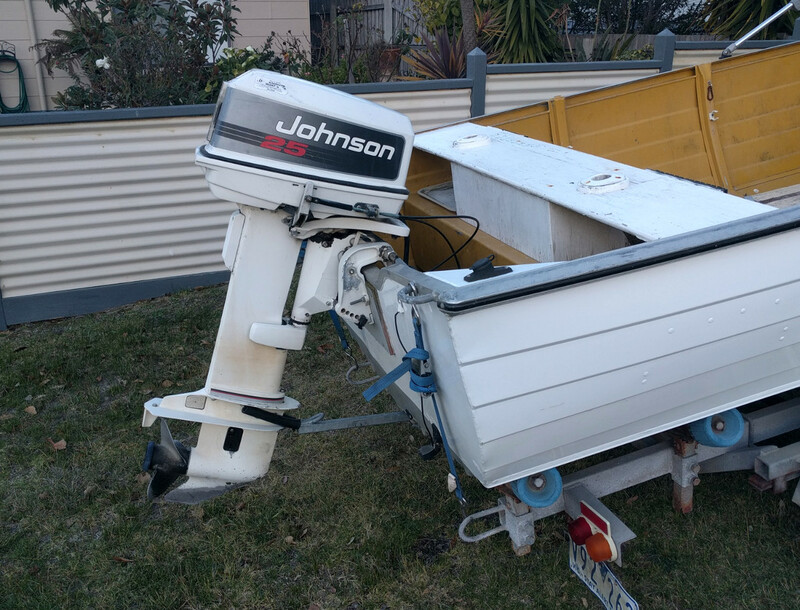 The boat ramps are getting a bit challenging and a few boat owners that have have not taken care have found themselves stripped to the underwear and pushing vessels off a muddy bank!! We are in for a little rough weather in the next day or so, but it should blow over in time for major outings from Friday to Sunday, the lucky ones will get Monday too! The recent 40mm storm has not caused the lake level to rise to nay noticeable degree. Fingers crossed for a very wet and stormy winter. A special hello to Neil M who has provided some valuable feedback on this column for us to work on. Comments by readers are greatly appreciated and always read in detail. Thanks Neil! 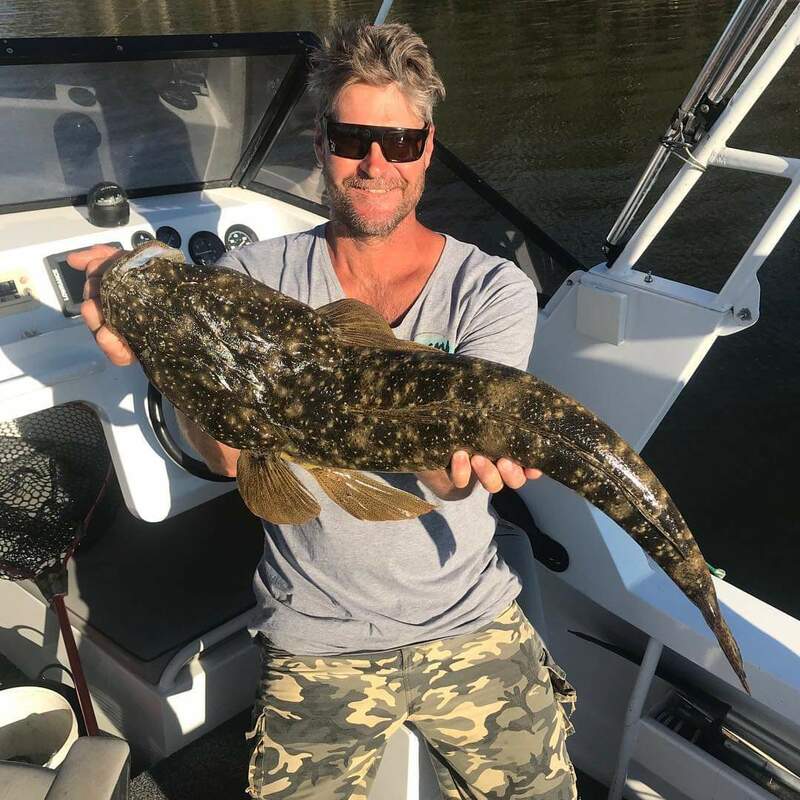 Just to add, Flathead have been quite prominent too in catches with people who target them regularly getting the trophy sizes (remember 55cm and over, handle and return safely!). Huge Tailor have also been encountered, so if you want to catch them heavy traces and lures are recommended. If they are around expect to lose your Bream tackle! Anglers have enjoyed more success this weekend with people able to get their bag of Bream and a few "take home" Flathead. 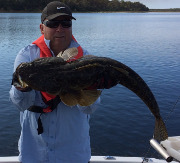 Reports of the larger Flathead are around with recorded catches of the monsters sizes around the 85cm mark. 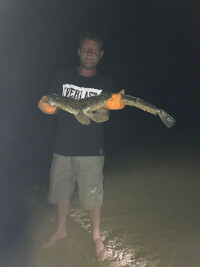 Other reports suggest that there are many Flathead in the lake at the moment and the lake would be appear to be in good condition in spite of being at its lowest level for a couple of years. Check the report on the Lake Level. Apologies for the long holiday break. We have no excuses there has been plenty going on, but keyboard time has been low! The lake continues to be at it lowest level for many years with sandbars appearing everywhere. However local gun fisherman Neil has been cutting through and has shared three nice catches with us. Show here is the very nice Trevally taken last week. 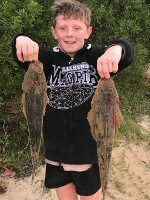 He also landed a really decent Flathead and Bream that are shown on the bragging pages. 26th Dec 2019: Flathead are stealing the show. Remember Blake Cameron? 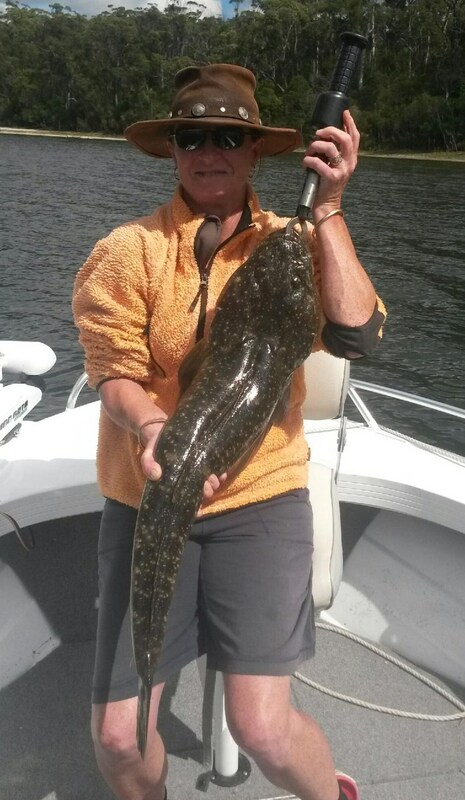 Well his dad, Gordon has been in touch this summer with a very nice 80cm Flathead taken off the bank near Mill Point. This is a magnificent breeder and essential to be returned to the water unharmed. Keeping these big females in top condition and breeding well is the back bone to keeping Flathead numbers up, and making sure there are plenty of <55cms (and >29cm) to take home for the plate. Plenty of small Bream cleaning up hooks, and if you are not rigged up the right way, the Tailor will just take your whole rig off, full stop. So take plenty of bait and tackle!!! Trent Davis (of Reel It In fame) and Scott in Flathead heaven. What gorgeous looking beasts? And we are talking the fish obviously. 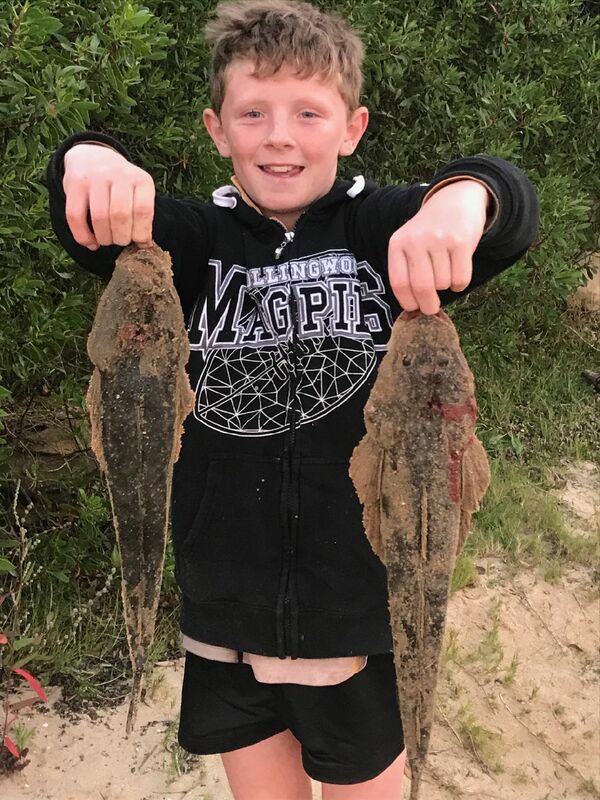 These are the future of the Flathead sport in Lake Tyers, properly landed, held and returned to live and breed another day. However it does require a bit more work than flopping a lure over the side of the boat. These girls are not easily fooled and you may have to work harder than you think to land one. 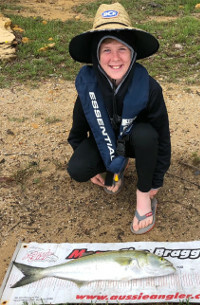 Cooper Wilson (11yrs, Lower Plenty) with a grand 68cm Tailor caught in the Nowa Nowa Arm on light Bream tackle. The fish launched itself out of the water several times and put up a real fight. Cooper eventually won out on the day and very proudly landed the catch in a net. This is the sort of fishing that captures young people's hearts and minds. Great to see the lake providing such opportunities. The algae is building up in the shallows over the sandy areas, and the lake has not risen significantly even though we have fairly regular bursts of rain. The temperature would be above the 20's and evaporation would be taking its toll as well with this hot summer burst. Flathead continue to capture the top news spot with plenty to brag about. Sprinkles (aka Shane Greaves) has landed a good catch on the shallows near The Glasshouse(?). 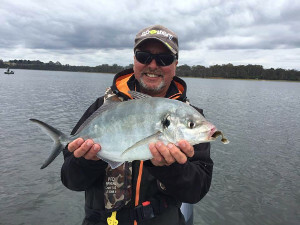 There is still plenty of water and idyllic spots to be fished on Lake Tyers this summer, but do take if you are in a boat and especially if you are the skipper. Get you and your crew back safely and enjoy the day out. Lake Tyers is frequently patrolled by both Fisheries Inspectors and Water Police, take care of yourselves and the fish! See you in 2019. Trent Davis is pictured kicking off his season with a really nice Flathead. This may need to be your target species as the Bream are hard to find and not really responding to any baits or lures. It will be a canny fisher who can bag out on Bream at the moment. The rainfall has been low again this year. From mid year 2016 (when my daily records began) to late December 2016 we had 327mm in that half year, whereas in all year in 2017 we had just 435.7mm, and so far in 2018 all year we had 401.7mm. This is barely over half of the 2016 rainfall. However the lake appears to remain in good condition and able to weather this dry cycle for a good bit longer. The El Niño predictions apparently say we will have a slightly wetter than normal summer, but that is at the expense of the overall decrease in annual rainfall, and especially over winter where crop growth is essential for farmers, and also for opening the lake! Low rainfall here also means the lakes does not have excessive run off from farm land with nutrients from fertilizers or live stock or natural vegetation break down. So the water is still in pretty good condition, even if not very high. It would be good to get a flush of the lake soon and a fresh influx of species such as Leather Jacket and Snapper that do not breed in the lake. 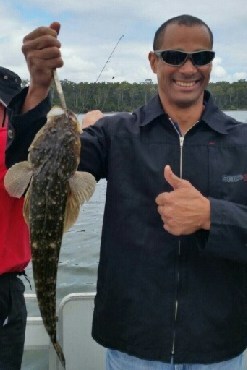 Well known local, Smokin' Joe has thrown down the Flathead challenge with a 95cm catch in the last few days. 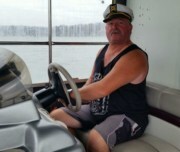 This guy knows his Flathead and how to work a boat and lures. Well done Joe, a handsome catch indeed!! Note the support for the fish's body. We have had a share of 67,500 Estuary Perch fingerlings released into Lake Tyers last week. 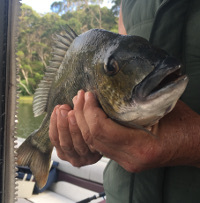 We get very few reports of EP's taken in Lake Tyers, but we were reminded that this elusive and slow growing fish is hard to catch and it was only 2016 when the last batch were released, not that long ago really. We have had nearly 50mm of rain recently over 4 days and has provided welcome relief to local farmers, but not really a breaking of the drought. Likewise we expect a bit of runoff into the lake, and some fresh seawater over the bar from the mild storm, but no great change in level. 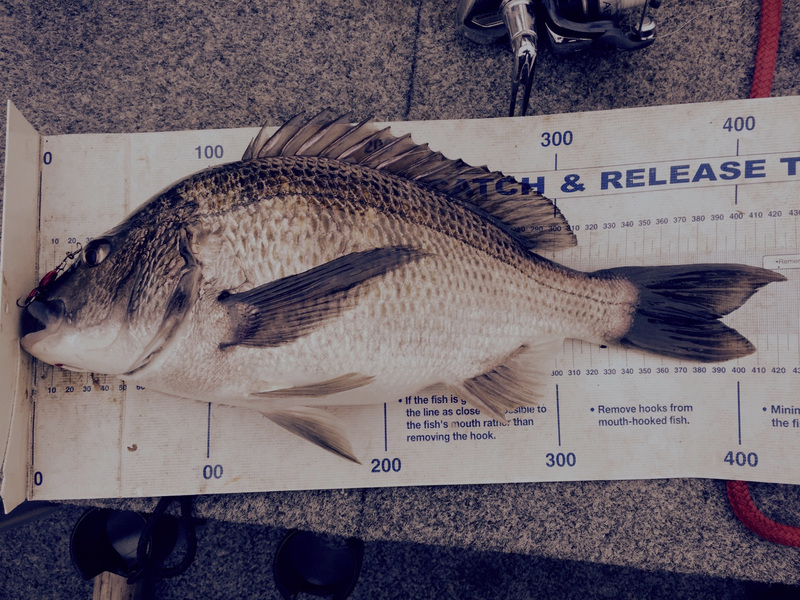 An 80cm Mulloway was caught and released by the team from "Reel It In". They captured the moment on YouTube, so unlike other Mulloway catches reported there is no doubt about this one. 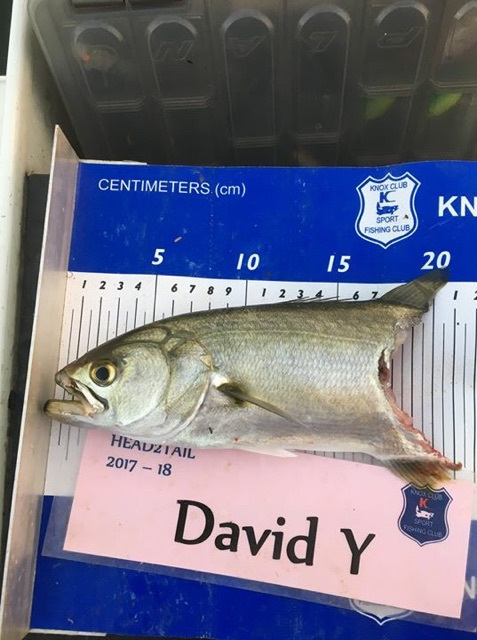 We doubt it is from the fingerlings, or more catches of smaller Mulloway would have been reported (the growth would have had to have been spectacular, and stayed through a number of openings). But this one certainly has been holed up for about 2 and a bit years as the lake has not been open for that long. 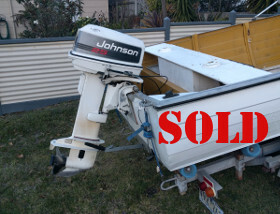 Whatever its origins it was certainly keeping in good condition, and congratulations boys on letting that one go!!! Well done!!! 2nd Nov 2018: Good advice! 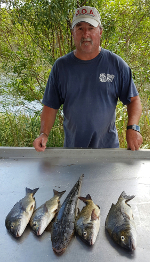 A report came in of a large Perch being taken last week. Above the 40cm, so unlikely to be the fingerlings that were released a few years ago, but indicates that the habitat for Perch is OK and maybe we can be hopeful the fingerlings are doing well and will be legal size soon, if not already that size. Very few reports come in for this species. Contrary reports on Flathead catches which is opposite to last week with indications they are biting much further up the two main arms. They are probably biting wherever there is natural food/bait to bring them on. Keep an open mind. 1st November 2018: Wide ranging fish activity. Many reports are coming in highlighting that the fish are on the move. Reports of Bream around the middle of the lake system down to the buoys, and Flathead sightings much lower, even in the shallows near the sandbars. Also plenty of bait-fish being chased by packs of Tailor as well. Though the water level is as low as possible, the lake appears clear and healthy. Weed is a nuisance in some of the more protected coves, but it also provides excellent feed and cover for juveniles. Don't forget the Tavern Fishing Challenge. Well organised and great prizes, with catch and release organised. The lake has begun to reach that critical temperature when reports begin to come in. Catches of 40cm Snapper around the glasshouse on Pilchard. Trawling for large Tailor has been mentioned, and Bream being taken up above Cameron's Tracks and at Cherry Tree. Hard-body lures have also been popular up around Nowa Nowa. The temperature may have to lift a bit more to get the Flathead stirring to biting stage, but some early catches indicate things are on their way. I had the pleasure of taking a couple of very special guests out on the water recently and all on board managed to bag a decent fish. Given that this was early in the season, it was a really good effort. A sign of better days to come. Well done folks, fantastic to have you aboard!! Looking forward to seeing you out on the water, and even more so to meeting you at the cleaning table! We don't run boat adverts here normally, just mention our friends occasionally. 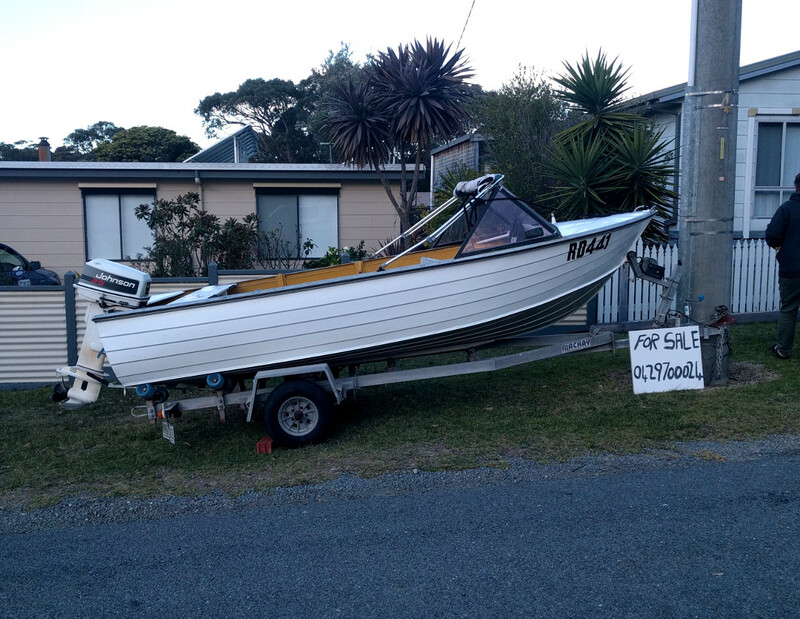 But in this case I must make an exception, No Fuss Guss is selling his Tinny for $4000. 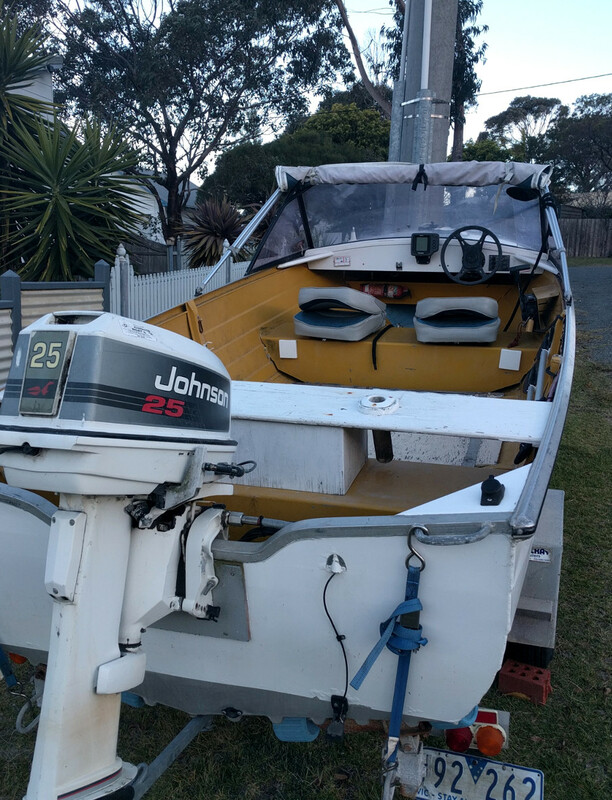 This tinny has been maintained by Guss so you know it will be in great condition and includes electric starter on the 25hp Johnson outboard, 2 anchors, two additional spare alloy wheels, rego to March 2019, sounder, lights and all boat safety gear (sorry, no PFD's). Contact Guss direct if you are interested. Mob: 0429 700 024 Click on image for enlargement. A few reports have come in of successful outings but they have been been sporadic and there has not been much consistency. The fish at this time of the year are spawning and talk has it that, when there is a drought on land, and we are having a "green drought" (ie the paddocks look green but there is very little in the way of true fodder on them), there is a drought in the fishing as well. We have been deliberately not putting up too much here as the stocks that are there, appear to be already under pressure anyway (Pro's, chemicals, Cormorants etc etc? ), and we should be patient until the next generation has been spawned before we go after the mums and dads. We should also be giving thought to supporting a slot size for Bream, ie if it is 40cm or bigger, we should put these breeders back in the water. I reckon it has worked for the Flathead, so why not Bream too? After all a good stud breeder does not send their prize bull or ram off to the butchers for a quick dollar. Above Cameron's Tracks for Bream and Pilchard in the lower lake for Tailor and Pinkies. Otherwise pretty quiet and conditions demanding even for experienced and usually successful anglers. 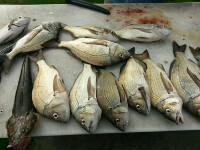 The Happy Hookers bucked the the trend recently though with nice catches of Bream and Flathead (see Bragboard). 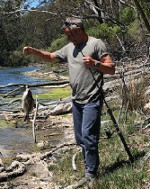 Bream have been taking hard-bodied lures and prawn high in the lake system around Camerons Tracks and above. Some have been found around Long point and higher up the Toorloo Arm. Tailor and Pinkies (Snapper) have been going for pieces of Pilchard. This is the pointy end of the season where the only the best fishers regularly catch fish, so it is with hope we are looking forward to the Twin Rivers Fishing Competition. It is a great event, with great prizes, so consider entering, and we can catch you up there. Only the best will win. There are still good big Bream actively taking local Prawn, in the 40-43cm range. However at the moment Pinkies around the 35-40cm mark are turning up in good numbers. Try Pilchard early morning or late evening. All the fish are in fine condition and carrying plenty of meat. 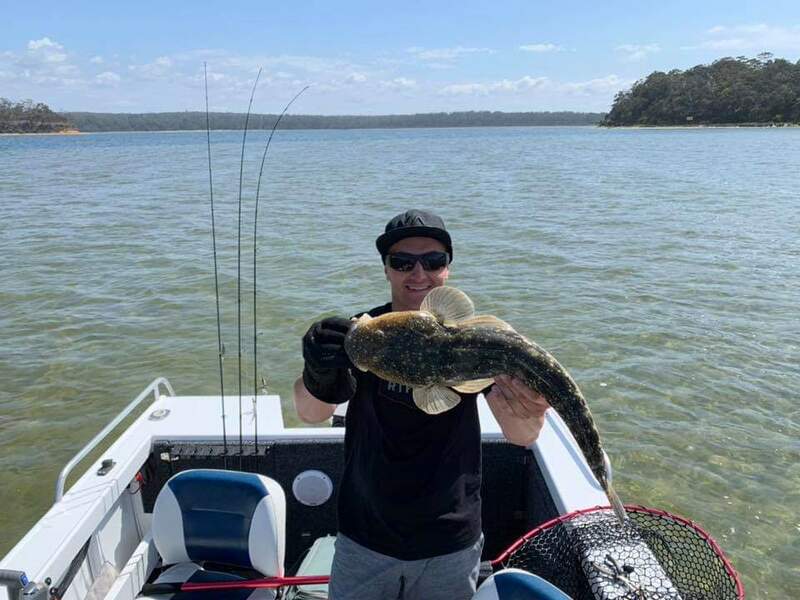 Large Flathead are also around with Kenneth Jonasson landing an 86cm on a plastic and No Fuss landing an excellent 77cm catch on prawn in the last week or so. The cleaning table was worth a chat the other day when a local fisher had his bag that included two 40cm Bream, caught on local Prawn. No Flathead, but plenty of good Bream. The Flathead have been hard to find since the big competition a month or so ago. 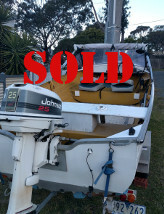 However the quieter waters since the Victorian and NSW school holidays have finished to have lifted the Bream catches. Still no sign of rain and the lake is as low as I have seen it for about 12 years. We will require some huge falls if the ground is to soak up first, and then fill the lake. If you are into Luderick fishing then there are a few on the bite in the arms of the lower lake on weed. Good catches were reported the other day, surprised us and probably have been off the radar for most people. You will need slightly smaller hooks, set under a float weighted with split shot to maximum sensitivity. Depth of bait can be critical and some experimentation around 75cm would be a good place to start. Weed can be "woven" onto the hook or loosely tied. Weed should be bright green, long and loosely filamentous. A few tugs on the float, and then a dive, should spell success. Plenty of small Bream around, but bigger ones to make up a bag are also to be found. The lake appears to be in good condition despite very low rainfall. The water level is at its lowest for many years (~10cm on #2 Rule, about 20-30cm drop since October), but the weather has been kind with no real heat waves likely to make the water temperature get too high, causing the oxygen to drop, and consequently causing a major fish kill. Local baits such as fresh School Prawns from the local trawlers are ideal. Chunks of Pilchard will work with nearly any of the fish. The traffic at the #2 Jetty has dropped off dramatically since Easter Monday, and the water is a lot quieter for fishing. 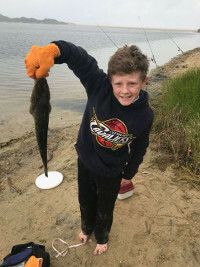 We are featuring a photo of young Blake again who continues to fish well. Snapper have been the highlight over the last fortnight. Serious fishermen (aren't we all serious?) have been struggling to make good Bream catches and the Flathead have gone a bit quiet as well. 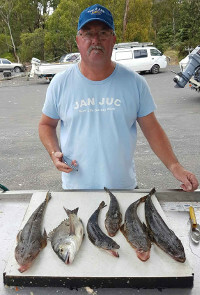 However local prawn and Pilchard around the end of the channel markers and at the east end of the lower lake have been yielding 40cm+ Snapper. These maybe a cohort that have been trapped inside for the last 21months, and probably arrived as medium Pinkies when the lake was tidal. There has been a considerable build up of windblown sand on the inside of the sandbar, however the water that was really murky a fortnight ago was as clear as crystal today. If you hook up a Trevally, as one young lad did, be prepared for a good fight! Half-peeled local Prawn has proven effective in other local lake systems. Flathead have again been reported most in catches. People have bagged out, people have caught PB's, and others happy with a decent keeper. However Bream have been harder to come by. 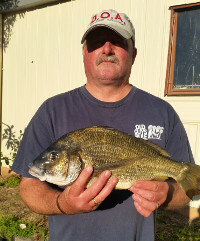 The fact the lake remained closed last year has seemed to have reduced Bream activity. There still plenty going on though, with Tailor around as well. Many of these fish are going to have to survive at least until the middle of the year before they might be able to exit the lake, so presumably continue to grow. There is evidence of a larger fish than usual being trapped inside over summer. Thanks to David for this one (left). Speculation is that it is a big trapped Mulloway, though others have said maybe a Seal (bite too clean and none have been sighted or heard?). 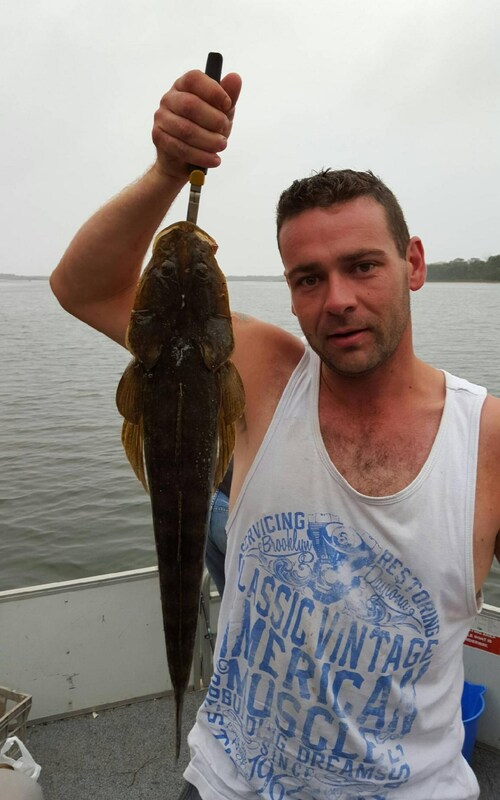 Anyway using Pilchard along "gullies" on the bottom lake, and Blackfellows Arm, and on the drift, has been very successful with Flathead, it even bagged a 40cm Pinkie. Local trawler Prawns for bait have been hard to come by, but should improve closer to Easter. There have been many reports all over the lake for good fish. Fishing early morning, or later towards night is a good variation if you are struggling for a catch. Plastics for Flathead, and bait for Bream perform well, with the space between boat and shoreline giving good results for Flathead. Chasing up local fresh green Prawns, eg off the trawlers in town, will be better bait for Bream than commercial products. There are plenty of Tailor around as well. So be prepared to up your leader strength if lose a fish quickly after a short run. 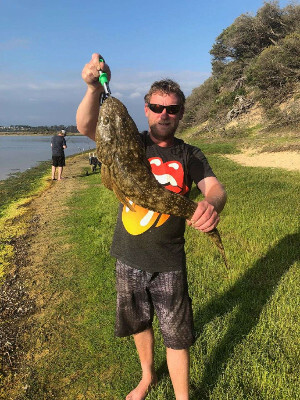 28st January 2018: Myth is "BUSTED"
There has been a lot of talk about the existence of really big Flathead in Lake Tyers, and this photo above should settle the arguments. Matthew Thewma has cracked it and landed a "magic monster" just over the 1metre. This is a grand old girl and thanks to his careful treatment should live to fight (and breed!) another day. Generally the Flathead have been reported as the most frequently caught. The boat ramps have been very busy so things have been pretty churned up. If you prefer a quiet fish then it may be best to hold off, until the weekend is over. Things have been hotting up down here and all over the state. 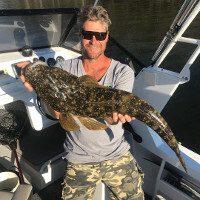 Just to show fishing can be a the best family fun, I suggested to Blake's Dad that Flathead don't just bite during the day, and maybe he should try a spot of night time fishing. As a result Dad landed this 80cm in the dark. Nice angling!!! There has been plenty of activity at the cleaning table over the last fortnight. However, no kudos to the people who cleaned a Bronze Whaler at #2 yesterday and just chucked major junks of the carcass out into the water out the front of the cleaning table. 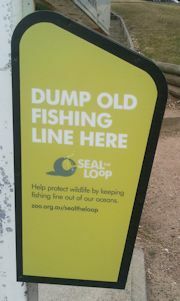 Just a reminder, the Pelicans will not eat this and Lake Tyers is not tidal, so this waste will hang around for a long time. Looking for a well run Angling Club to join that has a great social side, as well as good comps that go up against teams from across Gippsland? Well have a look at the Lake Tyers beach Angling Club's program for 2018. Well we are off and running into the 2018 Fishing Year. Sharing a yarn about fishing in the Tavern, I got talking to Blake Cameron and his dad. 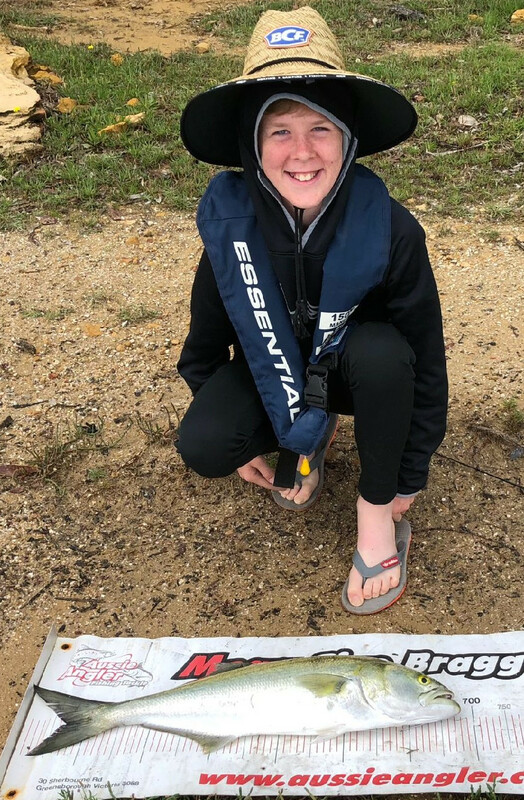 Young Blake landed 45 cm on soft plastic in front of the Tavern! His family lives in Seville (Yarra Valley). This was Blake's personal best (what a way to start!) 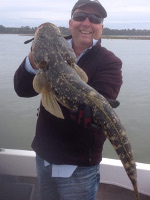 and just prove it was not fluke he went out and caught a similar Flathead the next morning. (See Brag Board). 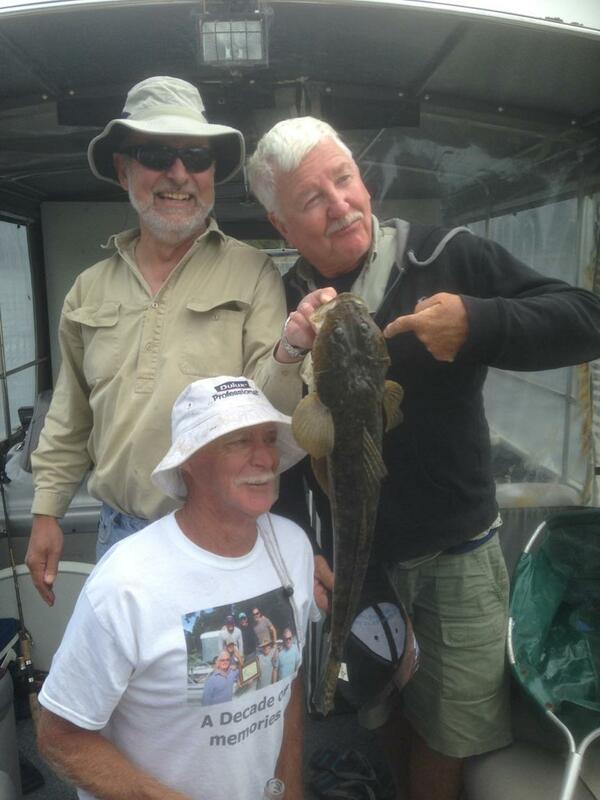 Other catches of Flathead, both keepers and monsters have been reported both on bait and lures. However be careful about the bait, especially Prawns and see if you can source the genuine local specimens. They should be a bit bigger and worth the little extra. 23rd December 2017: Bream are on the move. Good catches of Bream are coming in. Not all are taking bait with some of the lure specialists indicating they are as effective as bait. The lake is still as low as it gets, though the water has not got too hot, with a pretty cool Christmas and New year (30mm rain 2 days ago). However it is possible, in the upper reaches shallow water maybe low in oxygen as it warms up. We wish all our readers a happy and prosperous New Year, tight lines. We were greatly saddened by the passing of Loraine Frances, Guss's wife. Her recent passing was totally unexpected, though she had been ill for a few months before hand. Lorraine was a good fisher and in any of the competitions that we were in, she held her end of the bargain, catching good sized, very competitive fish. Though she would remind us Guss was her best catch. The community here at LTB is going to miss her infectious, irreverent humour and generosity. She is greatly missed and we extend our sympathy to Guss and her loved ones. 23rd December 2017: Big Flathead on the move. Fantastic Corroboree assisted by the FLOAT people last night. The spirits of the lake should be in a good humour after that epic performance. Reports of big monster Flathead coming in. 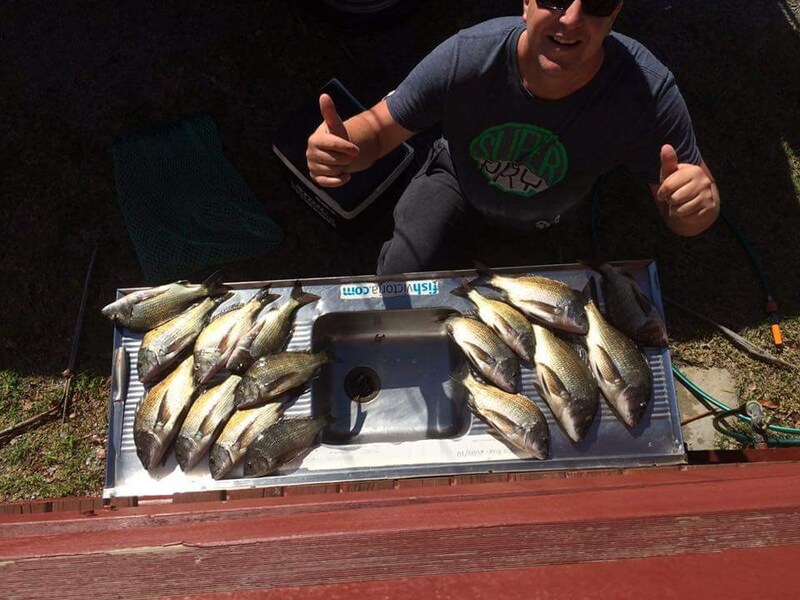 Warragul Angling Club (Happy Hookers) hooked up with quite a few last week. Our resident expert Jo has also landed quite a few already. If you catch one of these monsters make sure you handle them correctly, that is, use a net to land them into the boat or on the bank, lay them on a brag mat for the photo and quickly slip them back into the water. If you do hold them up, grab the body as well to take the weight off the fish's "neck" (see Jo left), otherwise you effectively "hang" the fish and survival rates go down. 21st November 2017: Good catches in many areas of the lake. While the fishing activity has not been intense, good catches are being more consistently reported. Flathead are being taken at good size and Bream from small to keepers around the Green Cabin and towards the Glass House drop off. 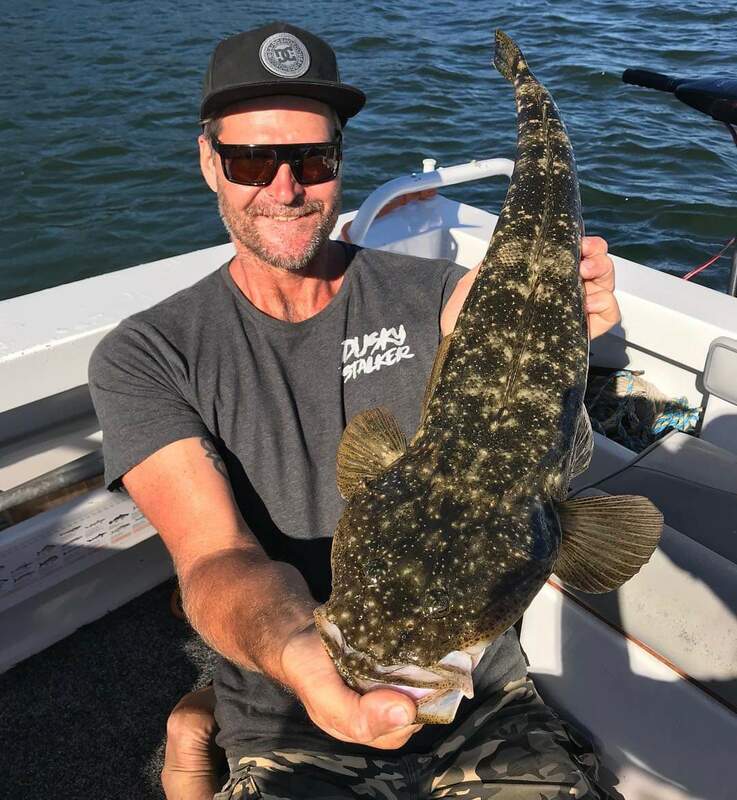 Visitor and enthusiastic fisher Leigh Diana (Pictured left) caught a few nice 49cm Flathead in Black Fellows Arm using a pink coloured, slider style lure, a "Kari Bay". Our regular visitors, The Happy Hookers also had a success with Flathead as well. Just a last minute reminder that the Tavern Fishing Comp is on this weekend (Fri, Sat & Sun) and it promises plenty of fun and prizes for all entrants to have a go at. Head down to the Tavern to pay your entry from Thu evening on wards, and pick up your ID and measuring strip. Best of luck to all the entrants. 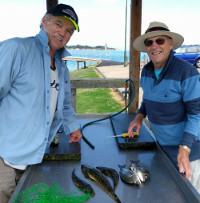 It will be interesting to see if any of the recently stocked species, Estuary Perch or Mulloway are caught this weekend. 13rd November 2017: Lake temperature on the rise and so are catches. Much more activity, and only a fortnight's difference. 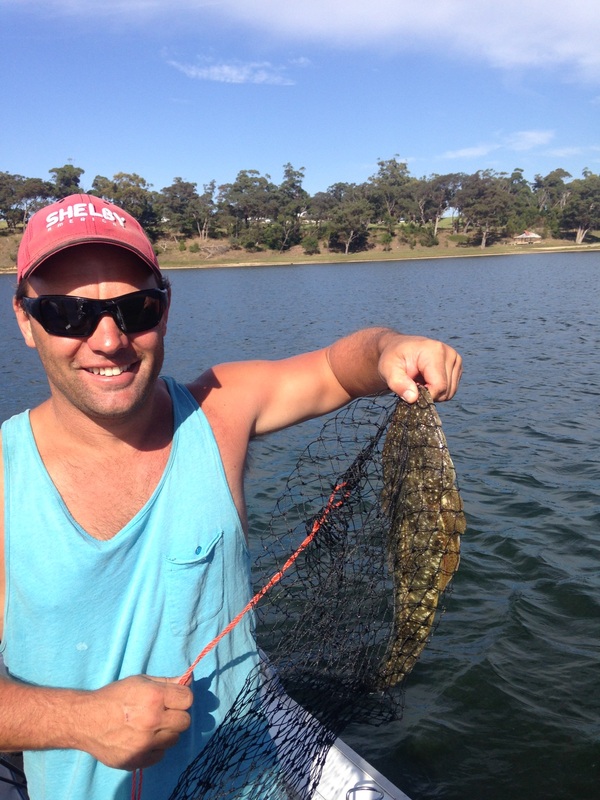 Catches reported of a many small Flathead and Bream, with a good likelihood of keepers. 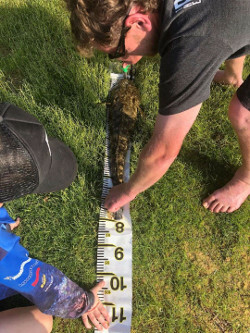 One huge Flathead 95cm (surely the maximum?) by Wolfman last week. Using simple bait like Prawns and Pilchard are attracting Bream, Flathead and Tailor. Places as far up as Devils Hole and all through the Toorloo Arm are producing bites. The water has clouded up a bit with recent rains, though not enough to lift the lake level more than a couple of centimetres. The lake's temperature has risen to 22ºC at #2 Boat Ramp and temperature probably accounts for most of the increased activity. 3rd November 2017: Things are looking better Reports are coming in that a broad range of fish are on the move and starting to shrug off that winter sluggishness. Flathead and Tailor have been reported in the Blackfellows Arm, and Tailor and Bream up as far as Devil's Hole, with some success using a cocktail approach to bait, eg Prawn and Sandworm on the one hook. The temperature is on the rise, as we would expect, and local seasonal rains have added a little cloudiness to the water making sneaking up on them a bit easier. However this is the spawning season, so you may see big numbers on the sounders, but to be honest they aren't thinking of feeding ATM. 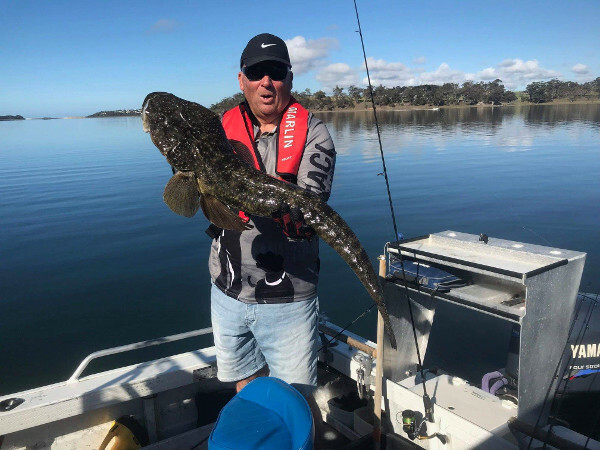 However quite a few big Flathead continue to be landed (Nick the Painter got a 65cm off the #2 Jetty), so keep you hooks sharp, and lines tight. 6th October 2017: Low turn out Well the boat ramp car/boat parking at Number 2 Ramp told the story. Hardly more than 3-4 trailers per day in it over the September school holidays. One quick sortie up the Toorloo Arm proved fish-less on the 1st Oct. However on the return Journey we mapped the surface temperature of the lake back to the boat ramp. This shows the temperature just up past Long Point was about 17.5C and fluctuated on the way back, down to about 15.6C across the main lake, and returning to about 17.3C at the boat ramp. Quite some ups and downs. Given that this is the type of sampling that boats read on their sounders it makes one wonder what use it is generally. Anyway we will be looking for better weather and more consistently higher lake temperatures before things begin to move. No opening this winter so things will certainly be different this year. 25th September 2017: Fish still elusive We are struggling for decent rains at the moment. It looks as though the lake will stay closed this winter/spring. However this illegal netting incident, where local fisheries officers apprehended 3 people using a 22.5m mesh net, shows that there are fish moving around the lake. Significantly though, most of the Bream netted look just size to a fair way under. This lines up with other reports that under size Bream are about the only ones active at the moment. Isolated catches of good Flathead have occurred, but often this is the single catch of the day. 4th June 2017: Cooling off.... The lake temperature is cooling quicker and the fish are harder to tempt. The water is extremely clear with no significant rain to bring down tannin-laden catchment water. The days are short and the algal blooms are all gone. Catches are being reported by the fishers who are keen enough to fish the evenings, but mainly up the arms. Smaller Flathead are still being caught. Photo left is a 42cm Bream caught just on dark with bait near Pile Bay. Lower down in the main lake is pretty much a waste of time, however I am happy to be proven wrong. 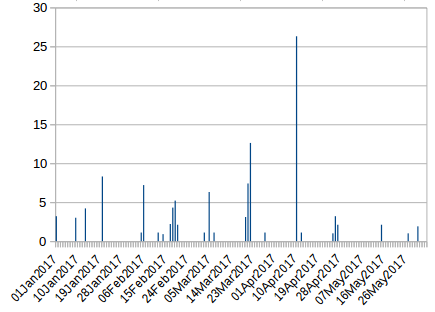 Just for interest's sake: Rainfall at LTB first half 2017. Not good! 2nd March 2017: Is the tide turning? 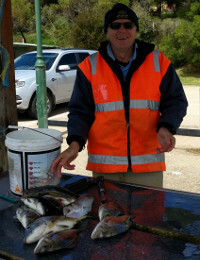 Garry (from the Bannockburn Angling Club) is showing the way here with a tidy catch of mainly Bream and some Flathead. Lake Tyers and other popular lakes such as Sydenham Inlet and Tambo Inlet have been slow to kick the summer season off. It has been reported by experts hard work to get a decent catch. However it looks as though the season may just be beginning. Local reports in the last few days would suggest an upturn and it is time to get hooks sharpened and get into them. Plenty of fish being caught, with Bream in fine form, with smallest to largest aggressively taking baits, notably up around The Island. Flathead, Eel and Snapper have also been found there as well. 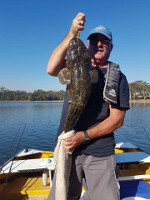 Flathead are active again around the lower lake drop offs and working well on lures. Other spots to consider are Whelans and Long Point where Bream have been active. 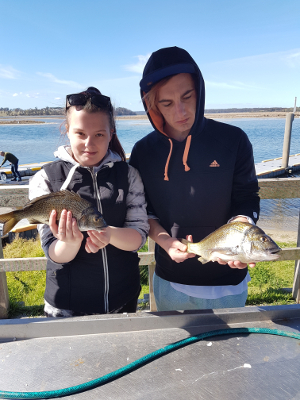 Simone (left) has landed a good sized Bream recently at Fisherman's Landing. 4 February 2017: Lake has quietened down and still fishing well. A couple of nice Bream catches to report this time, David Ray and Colin near fishing man's landing David's Bream 40cm caught on peeled Prawn. An excellent catch and without having to go right up the lake to catch them. 28th January 2017: Plenty of action on Flathead and Bream Flathead have been the most talked about, but Bream are also there for the taking as well. However results can be variable: Wife and Husband in boat together. Husband nearly bags out on Bream and Flathead and wife has only one "just size" Bream. Wife is a local champion fisher! A bad day can happen to even the best of us. But if you are going out anyway, here are the tips. Around the Glasshouse area for Flathead in a metre or less and along the banks and drop offs, and around The Trust below the power lines with Pilcahrd. Best on plastics. Bream from Fisherman's Landing up to The Island. Bream on peeled Prawn and Pilchard. Fair few small but good catches reported of larger fish. For those of us who will be around after this holiday weekend, the fishing is bound to improve when the mass churning of propellers calms down. 7th January 2017: Good results across the lake The year has got off to a fine start with many people taking good catches. Welcome back and I hope it is a good one for you too. This haul was picked up by myself and Maurie on Thursday. As usual the local Prawn produces regular results and these were taken from around the Trident (50cm Flathead) and Fishermans Landing. The weather is improving and people have been getting good Bream around the Nos2 Jetty late afternoon. Evening fishing with bigger baits, eg chunks of Pilchard and more rugged rigs will give you some decent sport with the Tailor that are frequenting those areas. 31st December 2016: Good year behind us, good things to come! 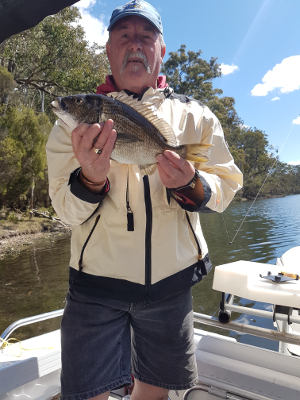 We hope you you have enjoyed our 2016 year of fishing tips and news from Lake Tyers Beach. 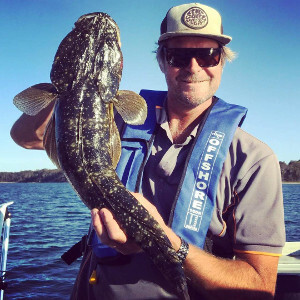 Just to finish off this year and give you a head start in 2017: Good Flathead have been taken midway up near Reedy Arm, Pirates Bay (aka Bulmers) and right down to the Glass House. Baits used at the time were local Prawn and chunky Pilchard. If the wind is light, then a slow drift along an edge is good to cover more ground, and hungry fish lurk around drop-offs. 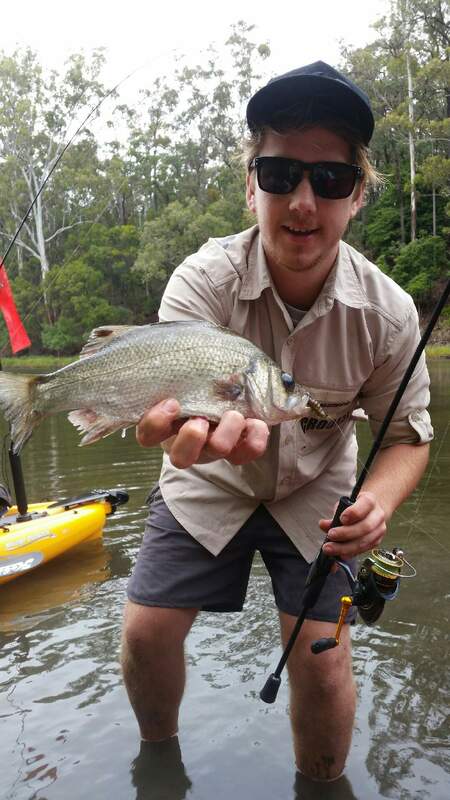 Reports of good sized Bream around sandy areas and same drop-offs. 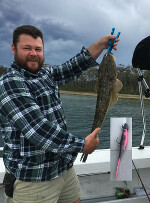 15th December 2016: Lures and bait working well on Flathead Things are shaping up well for the Christmas/New Year holidays. I have invited guest tipster Phil' from the Tavern to share what he has heard lately. 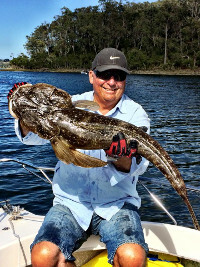 According to him: "The Flathead are biting well on both lures and bait. There are some big ones around, so don't be afraid to put on big hooks, 15lb leader and chunky baits such as strips of pilchard or even whole banana prawns. You won't be annoyed by having to de-hook tiddlers, and you will be in the running for a Whopper!!" Joe has landed another recently, (see left and Brag Board) and you might just catch him at the Tavern as well. Not only can you catch up with Phil' about the latest fishing news, but you can enjoy a beautiful frosty glass of your favorite brew at the same time. Take care, have a happy and safe festive season and easy as you go. No-Fuss Guss (www.laketyersbeach.net.au) (PS see you at Santa-Time Dec 25, 11am Tavern). Finally got out of the big smoke and back to LTB and caught up with a few mates. As I have been reporting, things are steadily on the improve and I managed to bag a few nice ones myself. Bait fishing with local prawn and slices of pilchard fished along the banks, in shallow water bought consistent results. The banks from The Island down to the main, bottom lake were producing good sized Flathead and Bream. 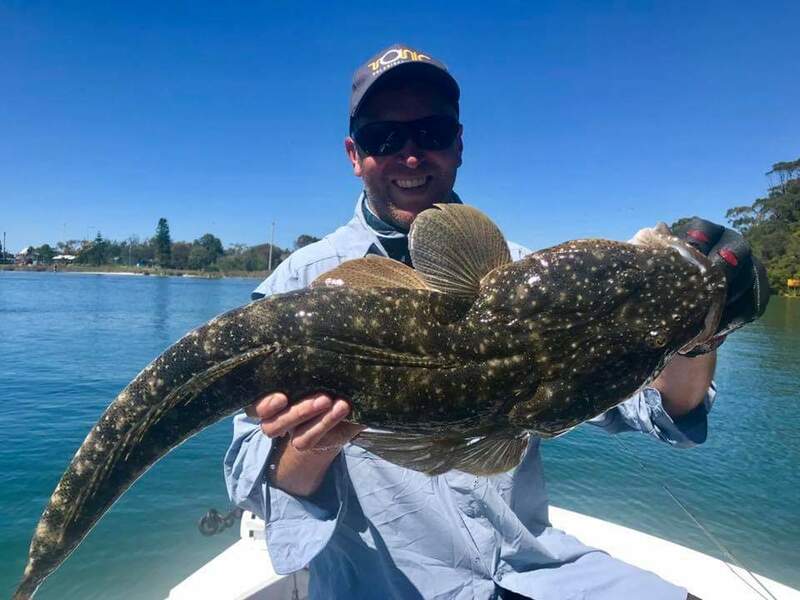 Catches of oversize Flathead are continuing to be reported and the slot size restrictions ie "55cm and over goes back" seems to be paying off with many anglers getting to up their PB's, by pitting their skills against an LTB monster. As well as keeping the breeders in the lake!! Handle with care. 23rd-26th November 2016. Check their website for all details on registration and activities. Fisheries are also offering Prizes for any Mulloway that are caught, photographed and released. Matty at the Tavern should be confident there will be good fish caught in the Comp' next week. Good catches of Bream and Flathead are being taken, though the more competitive locals are not sharing too much detailed information and are unusually tight lipped at the moment. There are plenty of boats around. One catch of an Octopus large enough to be cooked (well done Tommy!) was reported last weekend. These blokes (opposite) caught a handy feed this Sunday, fishing higher up, out of the wind. Well done guys! 23rd September 2016: Highway report! 1st September 2016: Very quiet! The lake has opened and is now tidal again with a natural breakout occuring on 7/7/16. The entrance is quite wide and good flushing is occuring. This is quite early as seasons go , so we may see another opening before Christmas. News has arrived that Mulloway released as fingerlings October last year have been caught just below legal size of 60cm. 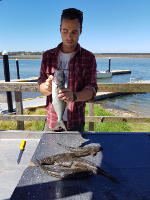 The local fishing club is helping collate scientific information on catches (and releases) of these fish in Lake Tyers. Please visit this page if you land one, as your help will be greatly appreciated. 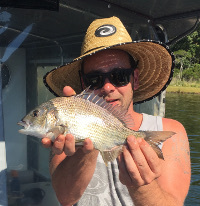 Bream keepers around the 30-34cm mark are across the lower lake with Flathead being picked up over near the Glasshouse and the drop off alongside the sand flats and the Mud Islands. Recent rain has not made much difference to the water levels, but it has freshened up the local water and campsites. Good bags of Bream on local Prawn being taken with anglers revelling in the warmer water and active fish. Use 1/0 to 2/0 hooks if you don't want to be taking small fry off your hook all the time. They will be hammering your bait so take plenty. The last few days of Easter holiday were dampened by 25mm of rain. However people down for the school holidays are getting some sunshine now. Try the banks and shallows in the bottom of the lake with lures and plastics for some good Flathead. 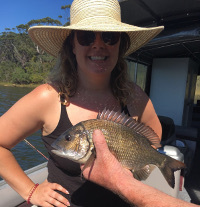 Jillian makes our photo opportunity this week with a good haul of Bream taken at Easter time. Check out Lynton Barr's comments on the Licence Fee rise. Plenty of fishing boats and good fishing going on here at Lake Tyers. Car park full and cleaning table busy. Apparently Pilchard has replaced local Prawns as the bait of choice at the moment. There are good Flathead to be had, and try inside the curves of bays. There are plenty of undersized Bream around, but in between good fish if you are patient. Recently had a post from Jack Crooks who caught this Estuary Perch on a Z-Man Grub in Black Fellows Arm. Certainly not one of the recently released fingerlings (they don't grow that quick!) but a nice indication of what we hope to see more commonly happening at Lake Tyers over the next few years. Nice work Jack. Take care and easy as you go. No-Fuss Guss PS Sorry about the absence of a recent tips page update as my mate Rob, who posts these for me, apologises to you all as he had been called away for a while on family matters. There have been various reports around, some people people have found their favourite spots have been stirred up by the high level of long weekend boating traffic and are finding the fishing quite difficult. 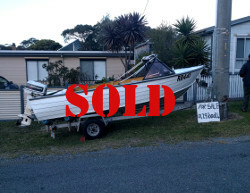 Others, around Fern Bay for example, have been taking Flathead, Bream and Tailor. As a result it may be time to try some spots high in the arms, above the 5kmph signs, and look for quiet spots along the banks. If you believe the motors stir up the natural berley, then maybe alongside the channel markers is for you. Take care and easy as you go. No-Fuss Guss PS Hope you have a safe and enjoyable Australia Day!